- Indirect drying using Stainless Steel Cylinders. - Suitable for one or two sided drying of all types of fabrics. - High Efficiency method for intermediate or final drying. We are a reputed name in the industry, devoted towards offering the best quality array of Drying Range Machine. 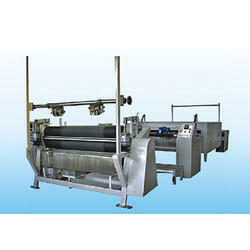 We are preeminent trader of diverse range of Textile Machines and Plants. Our products are highly appreciated for their robust construction, trouble free operation, easy installation and competitive prices. Drying Range Machine is revolutionizing the textile industry in a big way. - 2 B.P.M or 3 B.P.M with high structure and compensator is provided to synchronies with drying range. - Sophisticated Drying range unit with mirror polished 30′ S.S cylinder.